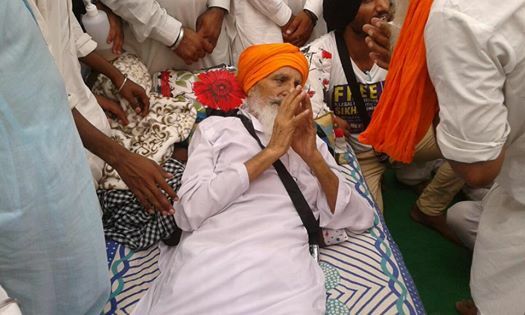 For most of Bapu Surat Singh Khalsa’s (Bapu ji’s) hunger strike, the politicians in Punjab have ignored his plight to free Sikh political prisoners. Questions directed at the former Chief Minister of Punjab (CM), Parkash Badal, about Bapu ji’s hunger strike, were often ignored or laughed at. As more time passed, and Bapu ji heroically remained steadfast in his resolve, the Punjab Government was inevitably forced to acknowledge his hunger strike and meet with representatives on Bapu ji’s behalf. His hunger strike has now surpassed two years. So far, 18 Sikh political prisoners have been permanently released and long-serving prisoners have been granted temporary parole. However, many more prisoners remain in jail, despite completing their given sentences. Bapu ji has stated he will continue his hunger strike until all the prisoners, who are eligible for release or can be released on humanitarian grounds, are granted their freedom. One major change occurred earlier this month when the 2017 Punjab election results were announced. Badals’ political party was ousted, and the Indian National Congress (INC) was reelected after 10 years. The leader of INC, Captain Amarinder Singh, was elected as the new CM of Punjab. What does this mean for Bapu Surat Singh Khalsa’s hunger strike and the Sikh political prisoners? Four years ago, in 2013, Captain Amarinder Singh gave a speech in which he directly addressed his stance on this issue. In it, he references his visit with the President of Pakistan, General Musharraf. He states that during this visit he had brought a list of Indian political prisoners that were being jailed in Pakistan for minor or no plausible offenses. General Musharraf agreed to let them go and Singh was able to secure the release of more than 300 prisoners. video of partial speech below. His message is clear: Punjab’s Sikh political prisoners should be released. While previous politicians in Punjab have gone to great lengths to avoid the political prisoner issue, Captain Amarinder Singh has explicitly stated his staunch support for their freedom. He even mentions specific numbers, stating there are more than 100 political prisoners that are eligible for release. In the speech, he also repeatedly refers to an individual who, at the time, is on hunger strike. In November 2013, Gurbaksh Singh started a hunger strike in Mohali to bring awareness to the issue of Sikh political prisoners. Captain Amarinder Singh expresses that he agrees with what Gurbaksh Singh is saying about the prisoner issue and that according to the law, he’s speaking the truth. 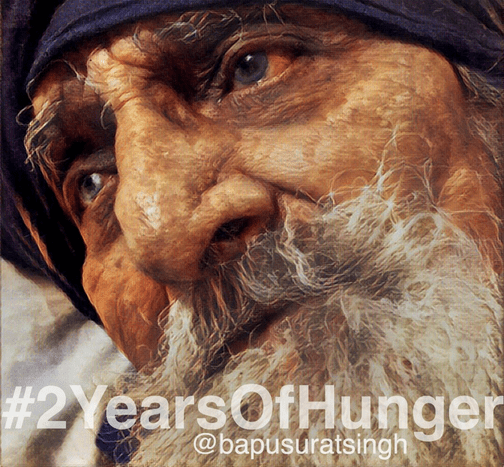 After ending his first hunger strike in late December 2013, Gurbaksh Singh started a second hunger strike in November 2014. It was when he ended his second hunger strike in 2015, that Bapu ji decided to undertake this mission and begin his hunger strike on January 16, 2015, to finish Gurbaksh Singh’s commitment to free the Sikh political prisoners. Present day, Bapu Surat Singh Khalsa is the individual on hunger strike and Captain Amarinder Singh is the political party in power. The current CM of Punjab has clearly stated his views on this issue and has made it exceedingly clear that these prisoners should be released from jail. Will Captain Amarinder Singh and the INC practice what they preach and release the Sikh political prisoners? Or will they decide to continue the torture of an innocent 84-year-old man on hunger strike?